Tim Jarman samples the Tangent Uno FM radio, and Patrick Cleasby tries Yamaha�s PDX-30 iPod dock and Sennheiser�s HD218 headphones. A bumper thirteen pages of your views and queries this month! Haden Boardman remembers the mighty Klipschorn loudspeaker. Noel Keywood previews this forthcoming hi-fi show. Adam Smith tries a complete mini system for the paltry sum of �20, or less! Tony Bolton pits Wales against South Korea in this premium integrated amplifier face-off! 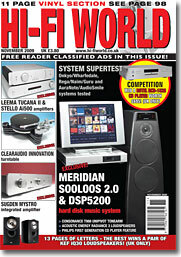 Noel Keywood samples an affordable pre-power amplifier combination. David Price tries a super new Class AB integrated from Yorkshire. Noel Keywood reviews the latest budget Blu-ray wonder from Eindhoven. Tim Jarman remembers the early days of fourteen bit Compact Disc. Patrick Cleasby tries this alternative FLAC-enabled iPod operating system. These big floorstanding speakers get the nod from Noel Keywood. Adam Smith tries a super new high end turntable. This affordable unipivot tonearm from China gets a review from Adam Smith. Paul Rigby auditions a fine new affordable phono stage. David Price walks you through the rebuild of this classic tonearm. Your chance to win a superb Rotel RCD-1520 CD player worth �695! Paul Rigby remembers Linda Ronstadt's Heart Like a Wheel.